The International Meeting of Early-stage Researchers in Paleontology traces its origins to the EJIP (Encuentro de Jóvenes Investigadores en Paleontología, or Meeting of Young Researchers in Paleontology), which is held every year in Spain or Portugal. In 2016 the XIV EJIP, organized in Alpuente (Valencia, Spain) mainly by paleontologists from the University of Valencia, was open to foreign researchers, thus creating the 1st IMERP. Since then both meetings have been split, but their aims are still very similar. To provide a friendly environment for early-stage researchers to present their research through oral or poster presentations and follow each other’s progress. To share new methods and ideas useful in Paleontology, and develop the skills of the attendees with the help of leading experts, invited to give lectures about their fields. The IMERPs are usually held in villages or towns located in countryside areas of geological interest. This way the meeting can be held in a closer and more friendly environment, as well as help to the dissemination of the regional natural heritage among the local population. A field trip to this paleontological and geological heritage is offered to the meeting participants. 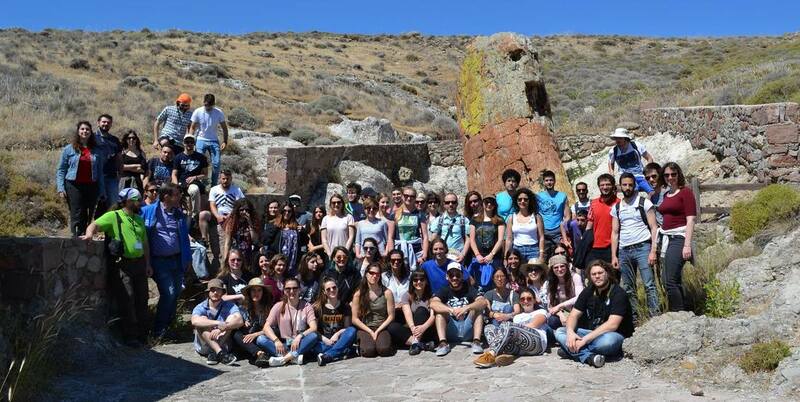 Field trip photo of the 2nd IMERP (2017) in the Petrified Forest of Lesbos UNESCO Geopark.